Vier stacks four 404s together to make its sound. Eisenberg's new synthesizer plugin for PC and Mac models the Doepfer MS-404, which itself is said to ape Roland's TB-303, making Vier something of a meta-emulation. The German developer of Einklang has gone further, though, duplicating the emulation into Vier four times. 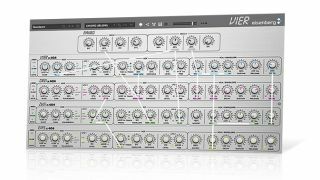 Multiple layers of synth goodness means cross-modulation - Vier's LFOs and envelopes can be patched to other voices' parameters, and there are macro controls so you can group parameters together for more complex and interesting movement. Thinking outside the box, Eisenberg has also worked 'Intelligent Voice Management' into the mix. Basically, this lets you assign notes of chords (presumably based on pitch) to specified voices. It's $/€69, rising to $/€99 after 30 September. Find out more on the Eisenberg website.